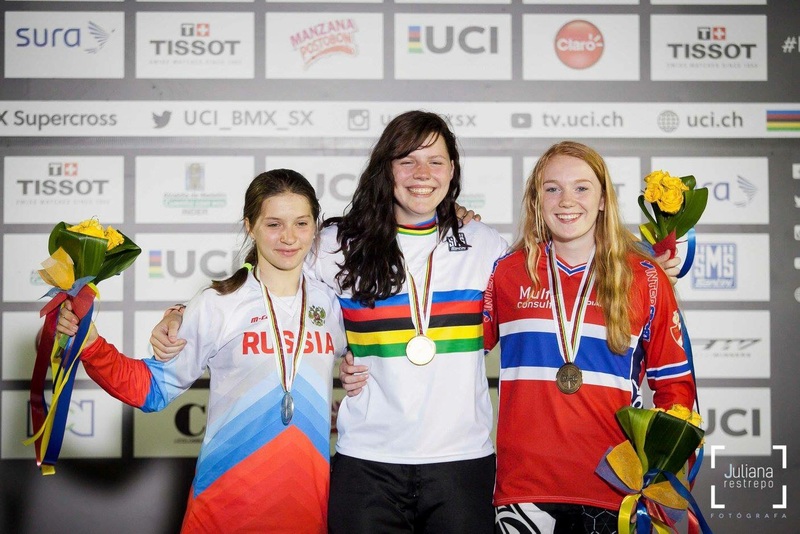 Ruby Huisman (17) is the current UCI BMX Supercross world junior champion. On the 29th of May, 2016, she annihilated her opponents in Medellin, Colombia to become the #1 BMX junior talent in the world. Not only is she a champion in BMX, she is a champion at life. I was fortunate enough to get the opportunity to ask her some questions about her life, challenges, and victories. There is a message in her answers for those who want to pursue their dreams. I still love it as much as at the beginning. The adrenaline, the speed! That gives me so much energy! So who is Ruby Huisman as a person? Tell us about yourself. I’m Ruby. I’m 17 years old and I live in Holland. I ride for the Dutch national talent team and have been on my BMX for 12 years. So I started at an age of 5. Where do you place BMX in its importance in your life? That is, would you say competing is as important as your family and friends? BMX is a very big part of my life. Of course, family and friends are important, but they know that BMX is important to me. Most of the time I’m focused on BMX. I do everything for it: my school, food, and appointments with friends and family are geared to BMX. How different is it being with friends from outside the BMX world vs. those you make in the sport? My BMX friends are so different from my friends at school. But I think that’s funny because in the world of BMX everyone is just themselves. That’s why I love BMX. At school, that’s different of course. Once I had a party for my birthday and I had my BMX friends and friends from school. It didn’t really work out that well haha. What has been the biggest challenge to success and what have you learnt from it? Hmm… I think that’s just to believe in myself. Sometimes I became uncertain and that made it really hard for me. At my gym sessions and track sessions, I always thought to myself: “I need to train like I’m number #2 in the world”. Do training and competing interfere with a “normal” life: school, friends, and so on? Sometimes I get really tired of everything, yes. But then I watch my old videos and I get motivated again so well! I am curious; why BMX – how did it all start? Haha, first I rode a horse. When I was 5, I saw my 2 brothers riding a BMX in Baarn, Holland. They told me I could try it too. Of course, I did that, because I wanted to be just like my brothers. From then on I never stopped. I still love it as much as at the beginning. The adrenaline, the speed! That gives me so much energy! I always thought to myself: “I need to train like I’m number #2 in the world”. Who is your biggest idol who motivates you every day? I don’t really have an idol, but if I have to choose I think that’s Mariana Pajon. Our gold medallist in London 2012. I really like her style of racing and she’s always smiling! And that is the most important thing. Is it the sheer nature of competition that drives your interest? It absolutely is! I always want to give my best. Whatever competition it is. You are the current BMX junior champion of the world. Tell us about the successes that came before getting here. When I was 9 I became world champion in China as well. I think in 2014 I was getting much better than before. I had started training with a new coach. 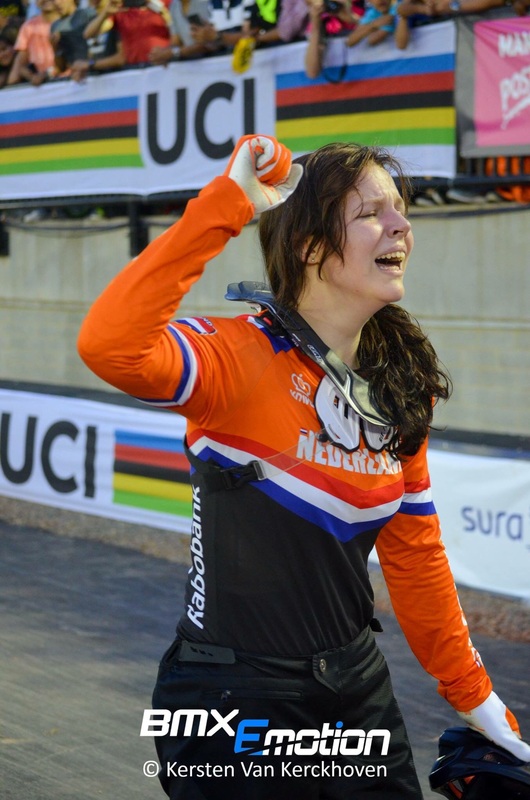 When I was 16 and a first-year junior, I made it to two semi-finals at the WorldCup in Manchester and Papendal. At the European final I came 2nd and was the world’s 5th in 2015. So I have been dying to ask you this question: How did it feel when you crossed that finishing line knowing you beat the best of the best? I worked really hard for it and it was a dream that became reality; a very emotional moment for me. I couldn’t believe it. The next morning when I woke up and saw that rainbow jersey next to me I believed it. I saw some videos of me crossing the finish line. I can’t even remember much from that moment. I worked really hard for it and it was a dream that became reality; a very emotional moment for me. What are you looking to accomplish next? Next year I get promoted to the elite women division. I’m not very nervous for 2017. I will be a first-year elite competitor. No pressure! I will just do my very best and will see where things go from there. You are very talented, but what is your plan to ultimate success in BMX and life as a whole? My biggest dream is to get gold to the Olympics of course. First, I just want to go to the Olympics and then I will see what happens. Tokyo 2020, here I come :). What can young women learn from your experience thus far in order to improve their future? Make your dreams come true. Keep that motivation in your head all the time you train, sleep, eat, do good and good will come your way. Please tell the readers where they can see you compete next. I’m racing at the European final in Verona Italy 10-7-2016 next. Good luck in Italy; we know you’ll make us proud! Thank you very much for taking the time to answer our questions. It has been a pleasure having you on The Zeit. Interview conducted by Alwi Mohamed Suleiman – Content Manager and Editor-in-Chief for The Zeit.